Located in the Transactions/Financials section of reports, the Transaction Sub-type Listing Report provides a listing of transactions that can be filtered using various criteria including: location, family, class, category, and more. 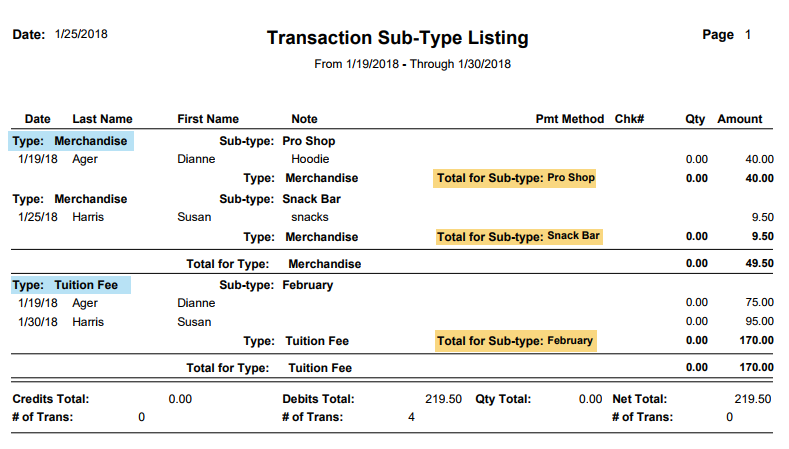 The report is sorted by Transaction Type with sub-totals by Transaction Sub-type. Totals are provided for debits, credits, and net total. These totals reconcile to all other revenue reports. Tax amounts are not broken out in this report. The Transaction Sub-type Listing report can be viewed /saved to PDF, Excel, HTML, RTF, Text, and Tiff.